What is love? And why does it seem so out of reach? What roles could come from the recent casting decisions from Marvel? With the news that both Michael B. Jordan and Lupita Nyong’o have now joined Chawick Boseman on the cast for Black Panther, what can we expect from their undisclosed roles? And what role, credited as “Security Chief” in Civil War, could Florence Casumba have? Of course, she could have been one of Black Panther’s bodyguards, one of the Dora Milaje, in which case it would be nice to see her again in another film, even if she doesn’t turn out to be anyone of importance. While Black Panther’s family and clan is varied, there are several positions that the other two actors could adopt. Ororo Munroe, for one, T’Challa’s wife, otherwise known as Storm. Bearing in mind that Marvel don’t outright own the film rights to mutants, there is a chance that they could still get away with it (like they have done with Scarlet Witch and Quicklsilver). Nyong’o could very easily fill in this gap, but there is also another role she could fit into. Half-sister to T’Challa, Shuri is one powerful and intimidating character. Naturally, it is well within Nyong’o’s capabilities to fulfill such a role. She’s dependable, hot-headed and also takes on the mantle of Black Panther at one point. After T’Chaka’s death, their uncle, S’yan became the next Black Panther. When Shuri eventually wished to challenge him for the role, she found out that T’Challa had already done so and was now the new Black Panther. Although they could cast Storm as anyone, I’m hoping Nyong’o will turn out to be Shuri. As for Jordan, it’s anyone’s guess. T’Challa has more cousins than Doctor Voodoo can shake his staff at. Perhaps Michael B. Jordan might not be playing a family member. There is the potential that he could be someone else. Someone much larger. M’Baku, one of Wakanda’s greatest warriors, tries to usurp the throne when T’Challa is away in New York. He becomes the villain Man-Ape, or White Gorilla. He’s quite big, though, and a very intimidating character. Somehow I doubt Jordan could be up for the role. 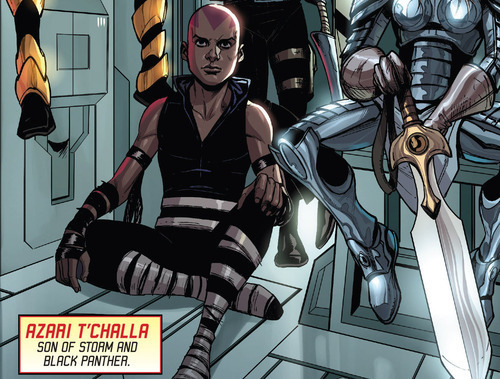 Of course, if Marvel so wished, they could always employ the role of Azari, son of T’Challa and Ororo Munroe. He’s from an alternate dimension, but that shouldn’t be a problem, film-wise. Black Goliath could be another candidate – he’s someone who fights using a version of the Pym Particle. Although that has been introduced in the MCU already, it would have to be explained. Depending on which universe they settle on, Jordan could always be Coal Tiger, again, son of Black Panther. If anything, I’d quite like Jordan to play a villainous character. It would be more interesting to have a younger character try to usurp power from an older figure, but that has already been done in the MCU when Loki tried to usurp the throne of Asgard. Perhaps not Man-Ape, but maybe someone working alongside Ulysses Klaue, rumoured to be reprising his role as Klaw in this film. For now, we’ll stay posted until we hear some more news. What do you think? Which characters would you like to see in Black Panther? What roles could you see Lupita Nyong’o and Michael B. Jordan in?